Every so often, John Paul from DayTradeToWin.com conducts a live webinar. He invites thousands of traders to see his signals in real-time conditions. Below, you’ll find a recent recording from one of these presentations. The focus was recent successful trading days as well as signals from the Atlas Line, ATO 2, Trade Scalper, and Roadmap. It was presented as a trading challenge, whereby John Paul set out to show the viability of the systems. These products are sold exclusively by DayTradeToWin.com. The entry signals are based on unique calculations. Beginner traders often quickly find themselves comfortable with these methods. Live training, videos, and courses usually accompany each product. Also, you will see two winning trades. One trade is based on the Atlas Line and the other uses the Trade Scalper. 11:29-13:26: Did you know the Atlas Line can be used on a 1-min chart? Want to register for the next live webinar? Head on over to DayTradeToWin.com and sign up to learn about the trading courses. You’ll be added to a list to get the next invite. As we approach the holidays, it’s important to have an idea of upcoming market closures. Fortunately, the CME Group posts holiday calendars, letting traders know about such conditions. The holiday trading calendars can be tricky to interpret, so we’ve condensed the notices as follows. Remember that we mainly look at equity products (aka markets) like the E-mini S&P 500, so some of these hours may not apply to you specialized commodity traders. The times below are listed in US/Eastern (GMT-5, New York time). The CME Group website typically uses US/Central, which is an hour behind New York time. Because Christmas Eve and New Year’s Eve both occur on Sundays, the CME Group does not indicate closures for those days. What comes next? Look for Dr. Martin Luther King, Jr. Day. On Monday, Jan. 15, 2018, the markets will halt at 1:00 p.m. and reopen in the evening at 6:00 p.m.
As E-mini traders, our view of the markets is more distant than someone who traders a particular company’s stock. For example, if you trade Apple’s stock, quarterly reports, press releases, product launches, keynotes, and other big events will typically drive value up or down. Remember that the E-mini is a fraction of the big S&P 500 index, which is composed of about 500 companies on the NYSE or NASDAQ. When the E-mini moves in one direction consistently, you could say that is because the overall U.S. stock market is trending the same way. In fact, many consider the S&P 500 the best indicator of U.S. corporate performance. As such, you, the retail trader are trading an abstract piece of they incomprehensibly large pie. It’s truly amazing stuff. With these considerations, Black Friday trading can be especially tricky. As we head toward the holidays, corporations begin consolidating annual reports and figures to give their shareholders. Almost by design, this excitement coincides with the holiday shopping rush. Two of the largest retail events occur in November: Black Friday and Cyber Monday. As more shoppers want to avoid the long lines, traffic, and occasional hostility of Black Friday shoppers, we see Cyber Monday becoming more of an attraction. Really, with two-day Amazon Prime shipping and how that pays for itself in a short period of time, one of the only reasons to go to a brick-and-mortar retailer is to find a deal you can’t find elsewhere or limited stock. As a result, you could say the markets, and therefore the E-mini S&P, are under a lot of performance pressure. Compounded by Turkey Day, Christmas, and New Years, we could see some high action. Regarding that high action, let’s talk about the January Effect for a moment. Yes, you’ve probably seen our other videos. These setups have become more consistent lately, probably because of the rush we just talked about. We don’t have much time left in 2017, especially when you consider the holidays. The big players won’t be at their desks. Sure, the high-frequency trading algorithms will be grinding away as usual, but you may not see the volume around trading holidays. That’s what it may be a good idea to take these long January Effect trades as they come. Look at what the Atlas Line found the other day. Really, watch the video. If you’ve been on the fence about picking up any of the day trading methods from DayTradeToWin to compliment this great end-of-the-year activity we’ve been seeing. Now is the time to do it. Hit them up via the contact page and ask them if they’re running any special Black Friday or Cyber Monday trading discounts. Was today’s E-mini S&P move predicted by the January Effect? John Paul thinks so. In this video, he explains why the January Effect can be a useful technique to find long trades in 2017. Today, we are seeing the market trend upward, which may be indicative of a retracement to the previous high. Days before, we saw the high reached, followed by days of price dropping. Since the January Effect has identified 2017 as a year of upward movement, we can wait for the market to “prove” that it’s ready to trend upward. After price drops, the climb back up is when you can potentially ride a trend into profit territory. The January Effect is easy enough to be considered a beginner trading method. NinjaTrader’s Fibonacci tool can be used to find the halfway point between two prices. Here, John Paul draws a line between the recent high and low. Watch for price to climb back through the 50% level, and that’s your entry point. Some traders prefer to enter when price surpasses the previous high. Use a day chart and scroll back to see what worked best. Of course, past market movement is not indicative of future movement. However, some traders swear by the idea that patterns in the market exist and can be used for future profit. Not every trader can hold a position overnight, as would be required by the January Effect. Instead, it may be wise to use a system like the Atlas Line. The Atlas Line provides intraday signals and can also be considered a beginner trading method, though it’s suitable for veterans as well. If you follow the rules, you are only holding a position for 20 minutes maximum. If the January Effect says to expect a bullish trend, then see if the Atlas Line signals also confirm that direction. The video provides a great example of this that starts at about two minutes in. Interested in getting coached on all of the DayTradeToWin.com methods? A new eight-week class begins Jan. 31, 2018. Classes are twice a week. Click here for details. The Atlas Line is a powerful trading tool that has been offered by DayTradeToWin.com for years. Hundreds of trading videos have shown its effectiveness in the E-mini and other popular markets. Today’s video is another addition. Look at how five of the six E-mini trades were successful, producing an estimated total of about +24 ticks of profit. Of course, profits or success of any kind cannot be guaranteed. The market can take a substantial portion of your money, so only trade with safe designated capital. Note that the trades in the video show how you could have profited under ideal conditions where the market filled you without any slippage. Broker fees and other trading fees you may be subject to are not considered in the estimated win total of $300, which is computed using $12.50 per tick multiplied by 24 ticks. Your experience may differ, but if you followed the rules, you should have produced positive results for today. The Atlas Line can help you learn how to trade choppy markets. The market conditions were rather choppy. Many other trading systems would have failed, calling entries or tops and bottoms at points where the market may have continued going up or reversed. The Atlas Line was quite accurate in pinpointing ideal positions ahead of when they occurred. John Paul often describes the Atlas Line as a “forward-looking” indicator. Whereas many indicators constantly re-optimize themselves using past price history, the Atlas line requires little maintenance. In fact, many Atlas Line clients find the included one-hour trading video sufficient for understanding how the strategy works. Free email support is provided in an effort to ensure understanding. Remote support is also included for new traders who may have difficulty installing or configuring the indicator. This is what makes the Atlas Line a great system for new or advanced traders – the support will fill in the gaps. Where does one get the Atlas Line? The Atlas Line is available from the DayTradeToWin.com website exclusively. It was recently updated for NinjaTrader 8, with a few tweaks as far as the signals go. The signals and colors work nicely whether you use NinjaTrader’s dark or light color skins. We find that the darker colors cause less strain on the eyes, especially if you’re staring into a screen for a couple of hours a day looking for fine details (prices, time, etc.). Here’s a chart of today’s E-mini S&P. Two products are displayed: the Atlas Line and ATO 2. In total, six trades occurred. Notice how the Atlas Line and ATO 2 “agreed” upon the short direction. How do you tell the two strategies apart? The Atlas Line trading consists of the blue dashed line, Atlas Short signal, and the small S and P signals. The ATO 2 consists of the ATO Short signal, the short dashed red line that points to the entry candle (in this image, it appears above and to the right of the number three). The blue/green line on the bottom is the ATR (Average True Range), which is a free indicator provided with most trading platforms. Both strategies use the ATR to calculate the profit target and stop loss. These systems are not fully automated. The signals are automatically generated, but it’s up to you to manually place each trade and manage it according to the rules. Both of these strategies will start to produce signals soon after the market opens. For the E-mini, the time is 9:30 a.m. US/Eastern. As of Nov. 5, we are now in EST which is GMT-5. Just using these two systems together, you can probably get four or more trades per day. Keep in mind that you probably don’t want to take every trade. If market conditions are too slow, too fast, overbought, oversold, or a news event is about to come out, then it’s probably best you stay out until volatility returns to normal. In the afternoons, markets can go flat, which makes for choppy trading. In the included live training, John Paul teaches you how to trade the methods in their entirety. 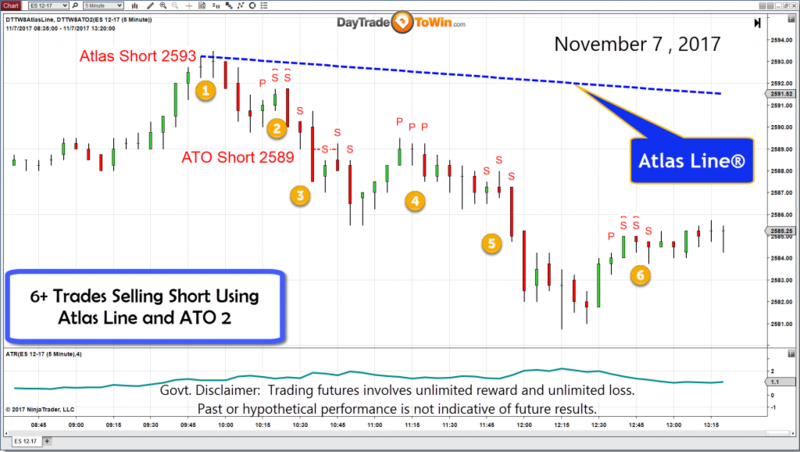 Note the ATO 2 and Atlas Line are sold separately, but you can contact DayTradeToWin.com for a special discount.